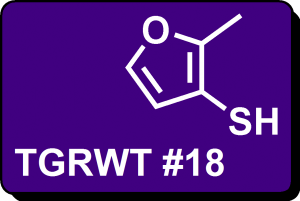 Just a short note to let you know that there were 30 submissions to the last round of They Go Really Well Together (TGRWT #18) which featured plum and blue cheese. Aidan Brooks summed it all up in a round-up which was fun to read 🙂 And in case you didn’t notice, there is a TGRWT tab in the menu bar – click it and you’ll see links to all the previous announcements and round-ups. In the near future I plan to transfer the pages with listings from the static pages (khymos.org) to the menu bar of the blog (blog.khymos.org) as this will allow me to use one publishing platform for updates. The remaining pages will probably be posted as blogposts. A number of things can go wrong when doing changes like this, so I’d be grateful if you could report issues (especially browser issues) you might encounter around the site. In case you wonder about the technical details: I run the latest version of WordPress with a modified version of the Contender theme. The dropdown menus are from Pixopoint. Some compatibility issues between an anti-spam plugin and the commentfrom caused all commenters to be met with the following: “Sorry, but it seems you are a spambot”. This should be fixed now. 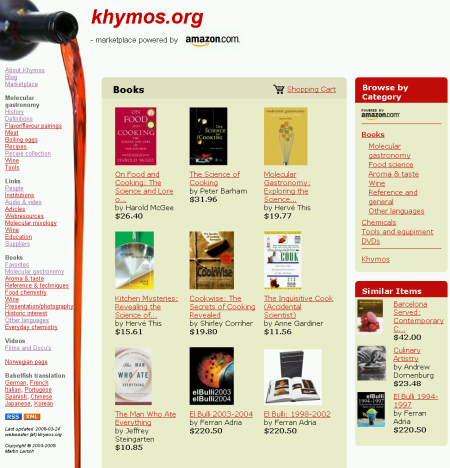 I just wanted to let you know that the Khymos marketplace is operative. You can now shop books, hydrocolloids, thermometers, scales, whippers, syringes, tubes, squeeze bottles, knives and more directly from this site. I’ve selected products that should be of particular interest for amateur cooks and professional chefs that are intersted in molecular gastronomy, molecular cooking and popular food science. The marketplace is powered by Amazon.com. Although I started blogging in August 2006, it wasn’t until 2007 that things got rollin’ so I thought I would post a “metapost” about my first whole year of blogging. 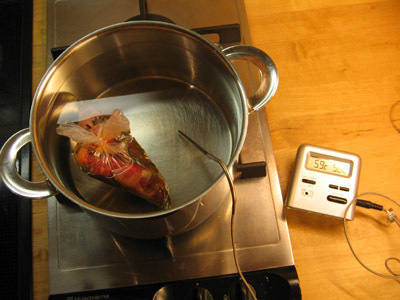 The most popular post by far this year has been the post on how to achieve a “Perfect steak with DIY “sous vide” cooking”. This is also the post which was most commented, counting 42 comments so far. I really enjoy that this topic has become so popular. Low temperature cooking can make a huge difference in people’s cooking, yet it doesn’t require any sophisticated equipment apart from a thermometer. It’s perhaps the best example of a technical application of molecular gastronomy in a home kitchen. The khymos site got a jump start in January as the static page on “How to prepare the perfect boiled egg” made it all the way up to the front page of digg.com (many readers left comments here). It’s amazing how this can drive up the traffic on a site! The single post which took the most time to research and prepare was without doubt the one were I presented the collection of hydrocolloid recipes. 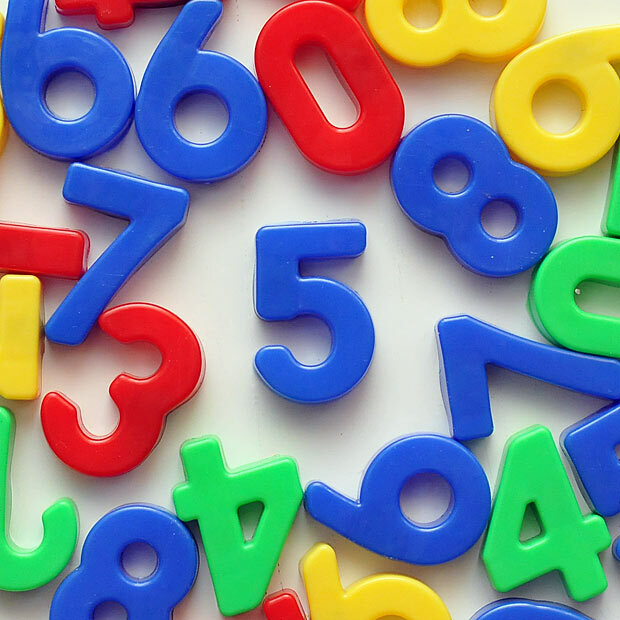 I spent quite some time searching for recipes and an equal amount of time formatting and converting them all to metric units and shortening down the text. Reception has been good, and since it was published in August, it has been downloaded more than 7000 times. I hope to publish a revised edition in 2008, and I am of course always eager to hear from you, especially if you have some recipes that you think should be included. I blog because I enjoy it. But if had to chose which posts were most fun to research and to write, I think the list would include “Perfect steak with DIY “sous vide” cooking”, “Two flavour pairing case studies”, “New perspectives on whisky and water” and “First experiments with sodium alginate”. The first round of the food blogging event “They go really well together” was launched in April. Since then 7 rounds have been completed with almost 90 submissions in total! I’ve had a lot of fun both preparing dishes and browsing through the round-ups. The current round is on white chocolate and caviar, and since December has been a busy month for most people (including myself), the deadline has been extended to February 1st. So if you’ve never participated before – why not try out one of the “classic” flavor pairings of molecular gastronomy? I admit that I am a passionate amateur photographer, and I have submitted a couple of pictures to the monthly “Does my blog look good in this” contest. But with around 100 contributions every month, and most of them of very high quality, I haven’t had great expectations of winning. 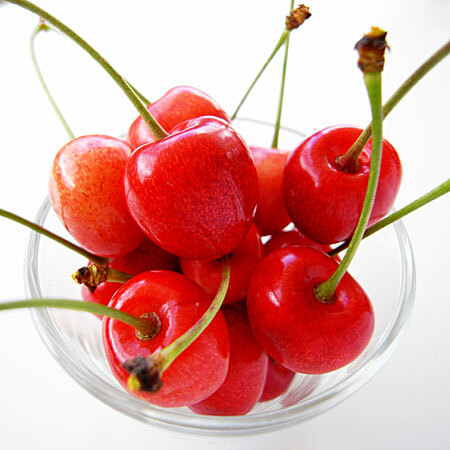 Therefore it was a pleaseant surprise that my picture of cherries (used to illustrate “Ten tips for practical molecular gastronomy, part 6”) made it all the way to the top of the August 2007 round of DMBLGiT (click to view gallery). 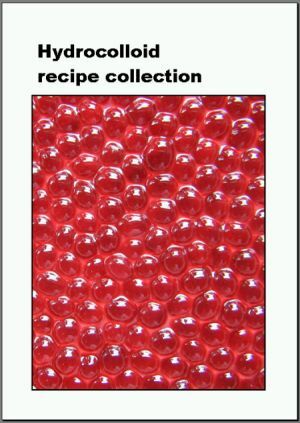 One of the first things I’ll do in 2008 is to complete the series of post with “10 tips for practical molecular gastronomy” which I started in January. Apart from this I have a number of unfinished projects that only need a little more research and experimentation – so let’s hope that I can find some time for this besides my full time job and my family! A great thing about blogging is that it allows me to interact with the readers – you. So far there are 514 comments to my 112 posts – thank you very much for taking time to comment my posts! Some of you also contact my by email, and I try my best to answer all emails, but if you haven’t heard back from me – don’t hesitate sending me a reminder to webmaster (at) khymos (dot) org! Because of all the spam comments (67,506 so far!) it’s difficult to say something about the number of people actually visiting the site, but there’s at least a couple of hundred unique visitors every day which is very nice and encouraging. So to all my readers I just want to say Happy New Year! (and in case you missed it, go back and read “Happy New Year with the Science of Champagne!” from last year). 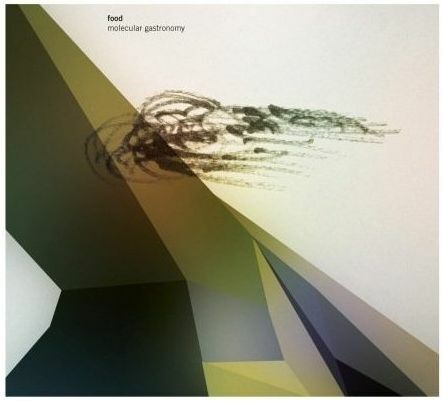 Some time ago one of my google alerts directed me to a brand new album by Food called Molecular Gastronomy, but it was only yesterday that a friend (check out his review of the CD) sent me a list of the tracks. To my great surprise the first tracked is named after my website – khymos (followed by tracks such as texturas, heston and spherification). Feels like an honour! Thank you Food! I haven’t been able to locate sound samples of the CD, but I’ll post an update if they should become available. The CD can be bought directly from the record company or through Amazon UK. I’ve received the Thinking blogger award from Cocktail Party Physics, Nika’s culinaria, Jon’s travel adventures, Lab cat and Chadzilla now. Thanks a lot folks! I guess it’s my turn to hand the award on now. Here are five blogs I read and learn a lot from: Food for design has many fascinating posts on design, architecture, science, nature and molecular gastronomy. Chadzilla and Hungry in Hogtown love to experiment in the kitchen and they’re good at documenting it! I also like the approach of Cooking for engineers and certainly also Harold McGee’s illuminating posts on different aspects of food science over at News for curious cooks. Read and learn! Besides these there are oohhh so many blogs I wish I had time to read more often … and your’s might be one of them. I have created the blog blog.khymos.org to accompany the website khymos.org. 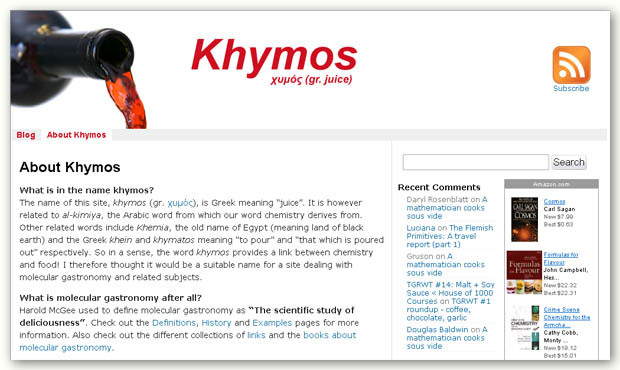 The name of this site, khymos, is Greek meaning “juice”. 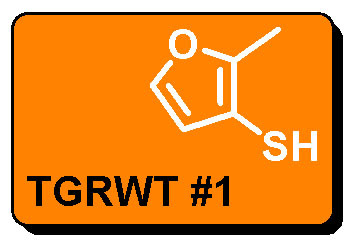 It is however related to al-kimiya, the Arabic word from which our word chemistry derives from. Other related words include Khemia, the old name of Egypt (meaning land of black earth) and the Greek khein and khymatos meaning “to pour” and “that which is poured out” respectively. So in a sense, the word khymos provides a link between chemistry and food! I therefore thought it would be a suitable name for a site dealing with molecular gastronomy and related subjects.